“We are lost?” Lost in deep space. A death sentence. The news was not good and did not get better after the computers came back on. They were deep in uncharted space, and there was no way to know if the jumpstream that had dumped them here would return them to Confederated system space. Though they tried around the clock, they were unable to communicate with anyone. Their small damaged ship was truly alone. They had enough supplies to last for perhaps sixty days. After that, the ship’s fuel would be gone, and they would die in deep space. Captain Ringel wouldn’t let them give up. They continued with repairs and communication but the mood was quiet, with bursts of anger. The crew was so young. 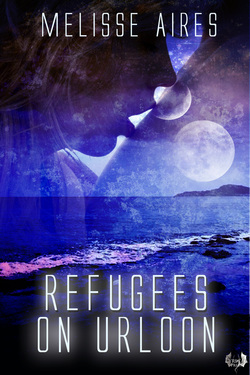 Svana mourned for their lost futures, and for her own daughter, so far away, whom she would never see again. Many nights, Svana held a weeping young one in her arms, giving what comfort she could. Going about rote chores in her supply room, Svana heard a shout from her open com. She climbed the ladder as fast as she could. The entire bridge was in a shouting, laughing uproar. Their distress signal had reached someone. Captain Ringel was talking to the contact in the small conference room. Svana waited with the crew for him to come out, hoping for good news, for a future. “Urloon. It reached a planet called Urloon,” Lu, one of the junior engineers, said. “Isn’t that a First World Planet? I remember learning something about Urloon in first school,” another crew member said. There were twenty days left of life support. The crew erupted into joyous shouts, leaping and laughing so the floor shook. In the tumult Captain Ringel’s gaze caught her own. He nodded slightly, and Svana knew it was an acknowledgment of the work they had done together.